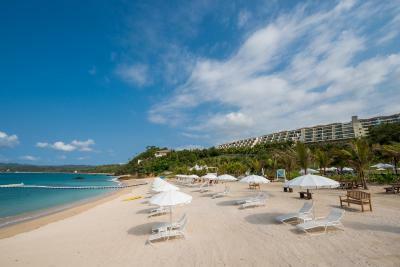 Lock in a great price for Kanucha Bay Hotel & Villas – rated 8.5 by recent guests! 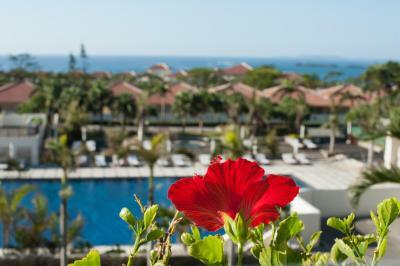 Amazing views, casual atmosphere, fun beach, beautiful rooms. Loved everything about the property. We went for my wife's birthday and she loved it especially the spa tub on the balcony. We are definitely coming back. The place was beautiful loved everything about it and the service was fantastic will definitely be coming back! Best Costumer Service. The Bed is so hard. They need to be replace. 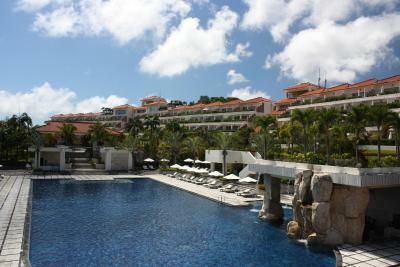 The resort is fantastic and has everything you need. Everything, it’s gorgeous! All the village is illuminated with Christmas and New Year’s lights. It’s beautiful. The staff didn’t speak English but were more than willing to try to help and accommodate us. The views were spectacular. The Orchid rooms were spacious and clean. The spa tub outside was nice but very small even for two small people. 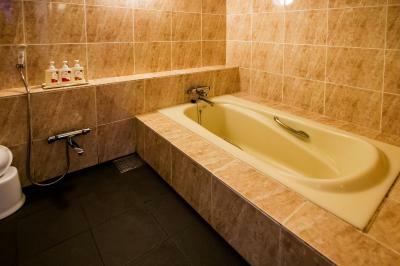 The shower room in the bathroom was also very nice and spacious. 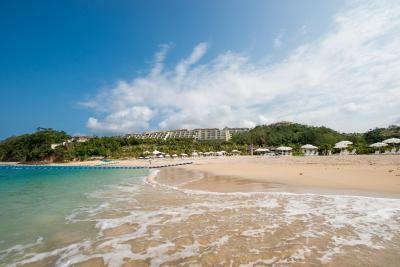 I loved the location, the staff was very helpful, everything that you need is right on the resort. Absolutely loved the friendly and helpful staff, as well as the amazing location and variety of things to do within the resort. Overall, the customer service is amazing and we really loved our stay. 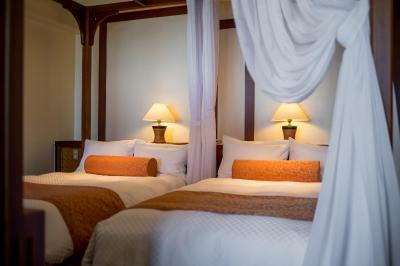 Kanucha Bay Hotel & Villas This rating is a reflection of how the property compares to the industry standard when it comes to price, facilities and services available. It's based on a self-evaluation by the property. Use this rating to help choose your stay! 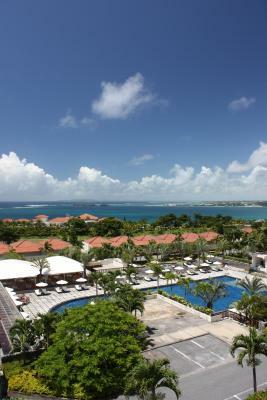 Boasting private beaches and golf courses, Kanucha Bay Hotel & Villas provides luxurious resort accommodations surrounded by untouched beauty of Okinawa’s nature. Beauty massage spas and outdoor pools are also on site. Free WiFi and free Parking is available. 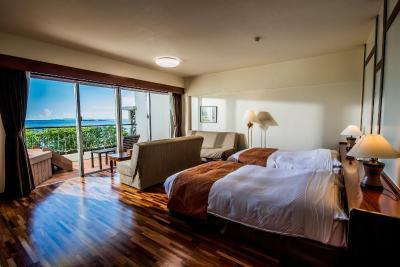 Featuring wooden flooring and a large balcony, spacious rooms are filled with bright sunshine and sweet tropical fragrance. 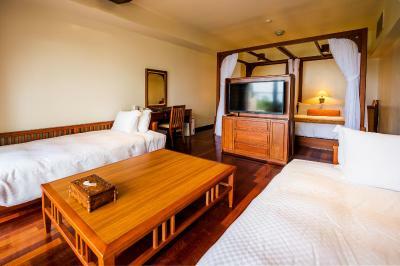 The rooms are equipped with a flat-screen TV and comfortable sofas. A mini-bar and an electric kettle with tea bags are also offered. 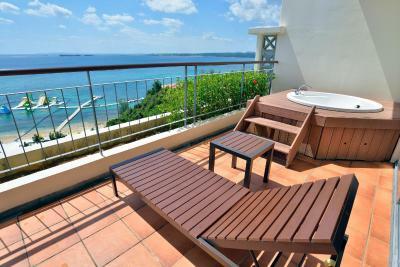 Some rooms come with a spa bath on the balcony, looking out to the ocean. 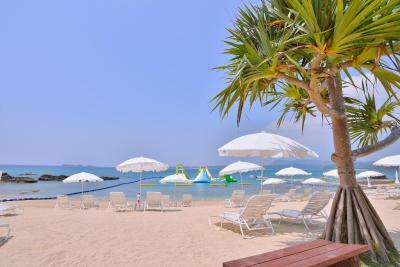 While staying at Hotel & Villas Kanucha Bay, guests can enjoy a range of activities like diving, fishing and golfing. After a day of activities, they can relax at one of the 4 massage salons. Shops for diving and golfing gear, as well as gift shops, are available. 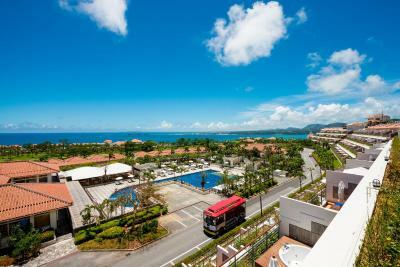 The property is an 80-minute drive from Naha Airport. 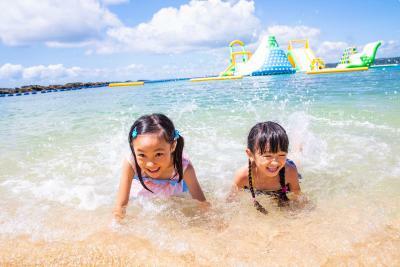 Popular Churaumi Aquarium is a 50-minute drive away. 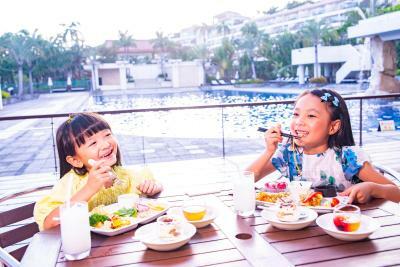 There are 8 restaurants at the hotel, offering a variety of meals like Japanese, Okinawan and barbecue grills. 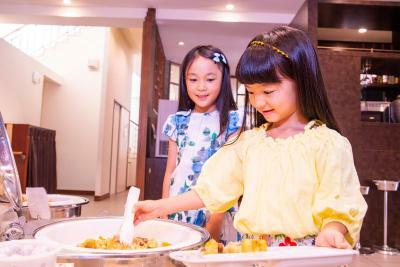 Paradis provides fresh Italian dishes, while Chinese delicacies are served at Ryukyu restaurant. 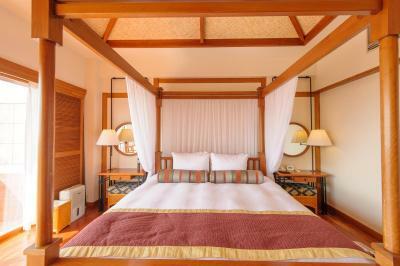 When would you like to stay at Kanucha Bay Hotel & Villas? This triple room has a balcony, spa bath and mini-bar. This triple room features a balcony, sofa and cable TV. This quadruple room features a balcony, electric kettle and seating area. Rooms are subject to availability and room preference cannot be guaranteed. Rooms are 66 square yards. 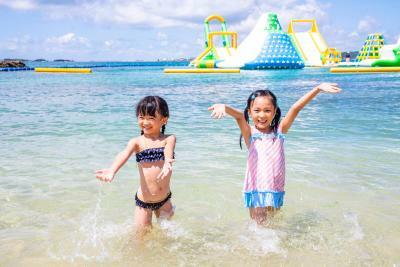 House Rules Kanucha Bay Hotel & Villas takes special requests – add in the next step! 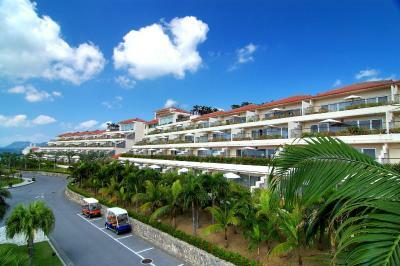 Kanucha Bay Hotel &amp; Villas accepts these cards and reserves the right to temporarily hold an amount prior to arrival. Kanucha Bay Hotel & Villas accepts these cards and reserves the right to temporarily hold an amount prior to arrival. Location - nothing around for miles. They charge you for *everything* and not reasonable prices (eg 1500 yen just to rent the chairs and parasol for the beach). Dinner at their Japanese restaurant (Kanucha) was disappointing and overpriced. 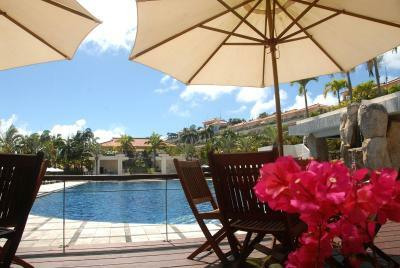 Unheated pools, expensive restaurants, remote location. The only thing is the closing time for the beach wish it was longer for a sunset on it. The food was a bit pricey but that was expected at such a quality resort. Other than that, ZERO issues. The bed is super hard. For the amount we paid a golf cart should definitely have been included because the resort is huge and everything is spread out. Walking at night was very nice but during the day it was extremely hot. I will say if I called the front desk for a ride they always provided one. The balcony had 2 fat rats that came out at night. The pools closed at 1700 and 1800 on the weekends although the sun was still very much shining. We tried all the restaurants and none were awesome but the steakhouse was the best. There also isn’t an ATM on the resort nor anywhere close. All amenities had a separate charge to include beach chairs. Surprisingly found the bed head and other furnitures are quite dusty. It’s very unusual in Japan. Called reception twice before arrival for some enquries but no one can speak English and they didn’t even try to transfer the call. 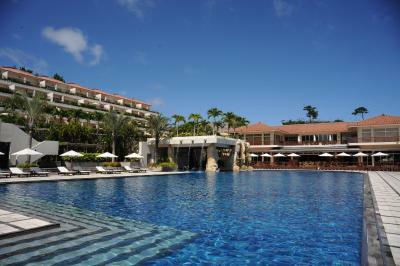 But found staff can speak English and Chinese when I arrived in the resort, and they were very helpful when we arrived. 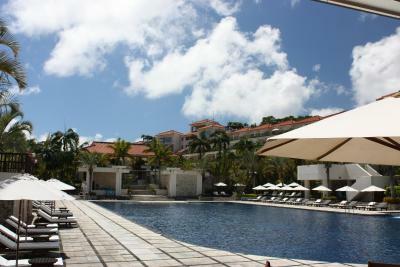 It’s a very nice resort with a lot of facilities and nice views. you can enjoy the sunset and beach walks. Really liked how they set up the bed and the brochures they provided for things to do in the resort. The lunch options were a little light compared to dinner. 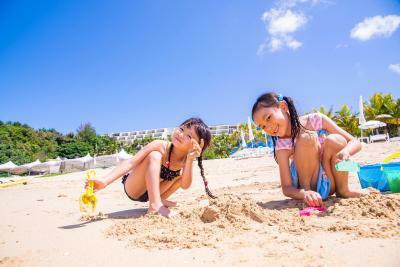 A lovely beach resort with lots of things to do and places to eat but also perfect for doing nothing and laying by the pool or beach. My spouse and I have been to several hotels, but as great as this resort. The location, staff, restaurants, and scenic was just amazing. I’ll return to this resort any day and recommend it to family and friends. The location of the beach wasn't very nice and there was no swimming. It was extremely far from anything on the island.